Tuesday, September 12, 2017, was the Feast of the Most Holy Name of Mary, the observance of which was instituted by Blessed Pope Innocent XI in 1683 shortly after the victory won by the King of Poland, Jan Sobieski, over the Mohammedans at the Battle of the Gates of Vienna, which had been fought to keep the infidels from overrunning the entirely of western Europe. The Most Holy Name of Mary was invoked by Pope Innocent XI in 1683 as he prayed her Most Holy Rosary to retard the onslaught of the wanton killers who belong to the "religion of peace," as it has termed by former President George Walker Bush and Barack Hussein Obama/Barry Soetoro and has been been honored by conciliar "pope" after conciliar "pope," including Jorge Mario Bergoglio in the past fifty-four months, Mohammedanism (see also Jorge's Plim Plim Religion and Not the First Time for "Uncle Teddy"). This is what Pope Saint Pius V had done as he prayed the Rosary on October 7, 1571, to support the combined Christian fleets as they battled the Turkish fleets in the Battle of Lepanto one hundred twelve years before. We should make the Sign of the Cross every time we begin any work or activity. Indeed, although I no longer support major league baseball with my own money and attendance, I do read about the sport now and again. And every once in a while there are stories about players, some of whom make the Sign of the Cross every time they go to the plate to bat, who do so after some incident. Former New York Mets' pitcher Rick Reed did so in the late 1990s when he caught a line drive that almost hit his head. Former Mets' outfielder Cliff Floyd, now retired, made the Sign of the Cross as fellow outfielders Carlos Beltran and Mike Cameron were carried off the field on stretchers following a collision at Petco Park in San Diego, California, in August of 2005. We should make the Sign of the Cross many times during the day as this helps us keep in mind that we are called to lift high the Cross always and everywhere and with everyone. Images of the Holy Cross of the Divine Redeemer have worked countless prodigies through the centuries. Its very form has been impressed upon saints, including Saint Francis of Assisi (the Feast of the Impression of the Stigmata on Saint Francis in the calendar of Roman Rite of the Catholic Church is in in three days, that is, on Saturday, September 17, 2016) and Padre Pio, among others. Images of the Holy Cross have produced countless conversions, that's right, conversions, to the Catholic Church. Chosroes of Persia, having, in the last days of the reign of the Emperor Phocas, overrun Egypt and Africa, in 614, took Jerusalem, where he slaughtered thousands of Christians and carried off to Persia the Cross of the Lord, which Helen had put upon Mount Calvary. Heraclius, the successor of Phocas, moved by the thought of the hardships and horrid outrages of war, sought for peace, but Chosroes, drunken with conquest, would not allow of it even upon unfair terms. Heraclius therefore, being set in this uttermost strait, earnestly sought help from God by constant fasting and prayer, and through His good inspiration gathered an army, joined battle with the enemy, and prevailed against three of Chosroes his chief captains, and three armies. There is a lesson here: we must be humble to carry whatever crosses God in His infinite wisdom and mercy chooses to send us for our sanctification and salvation, desiring us to offer these crosses back to Him through Our Lady's Sorrowful and Immaculate Heart as her consecrated slaves. We must pray for crosses. The cross is the path of our salvation. Perhaps most importantly, we must thank God from the bottom of our hearts for each cross we are asked to carry, no matter how seemingly heavy, as each cross is a sign that God is not yet through with our sanctification. We should worry when God does not send us crosses! 'Hail, O cross, formidable to all enemies, bulwark of the Church, strength of princes; hail in thy triumph! the sacred Wood still lay hidden in the earth, yet it appeared in the heavens announcing victory; and an emperor, become Christian, raised up from the bowels of the earth.' Thus sang the Greek Church yesterday, in preparation for the joys of today; for the east, which has not our peculiar feast of May 3 [that is, the Finding of the Holy Cross by Saint Helena, mother of Constantine--TAD], celebrates on this day on the solemnity of both the overthrow of idolatry by the sign of salvation revealed to Constantine and his army, and the discovery of the holy cross a few years later in the cistern of Golgotha. Though not being aware of the nearness of the dedication of Saint Anastasia, or church of the Resurrection, to the feast of the holy cross, many have misunderstood the discourse pronounced on this fest by Sophronius the holy patriarch of Jerusalem. ‘It is the feast of the cross; who would not exult? It is the triumph of the Resurrection; who would not be full of joy? Formerly, the cross led to the Resurrection; now it is the Resurrection that introduces us to the cross. Resurrection and cross: trophies of our salvation!’ And the pontiff then developed the introduction resulting from this connexion. It appears to have been about the same time that the west also began to unite in a certain manner these two great mysteries; leaving to September 14 the other memories of the holy cross, the Latin Churches introduced into Paschal Time a special feast of the finding of the Wood of redemption. In compensation, the present solemnity acquired a new lustre to its character of triumph by the contemporaneous events, which, as we shall see, form the principal subject of the Roman liturgy. Indeed, who will not crucify himself? We must do so as we seek to worship Our Blessed Lord and Saviour Jesus Christ, He Who won the victory over the power of sin and eternal death on the wood of the Holy Cross, with our deeds, not only by means of our words. The victory thus chronicled in the sacred books of the Church, was not, O cross, thy last triumph; nor were the Persians thy latest enemies. At the very time of the defeat of these fire-worshippers, the prince of darkness was raising up a new standard, the crescent. By the permission of God, whose ensign thou art, and who, having come on earth to struggle like us, flees not before any foe, Islam also was about to try its strength against thee: a two-fold power, the sword, and the seduction of the passions. But here again, alike in the secret combats between the soul and satan, as in the great battles recorded in history, the final success was due to the weakness and folly of Calvary. As Dom Gueranger alluded, the enemies of the Cross of Christ, the Jews, the Mohammedans, the Freemasons, the Bolsheviks, and all manner of secular constitutionalists seek to bury the Cross of Christ as It is held high by the Catholic Church just as surely Emperor Hadrian had done with the True Cross in Jerusalem in the Second Century A.D. The devil knows that the Cross is the instrument of the conversion of the Jews, the Mohammedans, the Freemasons, the Protestants (most of whom hate Crucifixes), Bolsheviks and the ideologues who are wedded to a containing words that do not once mention the Divine Redeemer as the standard of national order. We must never prove ourselves to be enemy of the Cross of the Divine Redeemer. We must never permit ourselves to instruments of the Talmudic effort to bury the Holy Cross from the sight of men more and more by giving any credence, no less active and vocal support, to naturalists, whether of the “left” or of the right,” who, despite their relatively minor differences on matters of policy, are completely uniting in their false, heretical, and blasphemous belief that it is possible for nations to know true unity and authentic social order absent man’s visible homage to the standard of the Holy Cross which we must always lift high and never be ashamed to call our own. Martyrs, including the North American Martyrs, gave up their lives as they held high the standard of the Holy Cross as the only foundation of personal and social order. So must we, especially in the circumstances of our own daily lives, something that was emphasized by Father Edward Leen in Why the Cross? We must always beg Our Lady's help as she, who stood so valiantly at the foot of the Holy Cross of her Divine Son atop Golgotha on Good Frday, stands at the foot our own daily crosses, and she sends us all the graces that we need to lift high those crosses with joy, love, and gratitude as befits redeemed creatures who were recreated on the wood of that same Holy Cross. 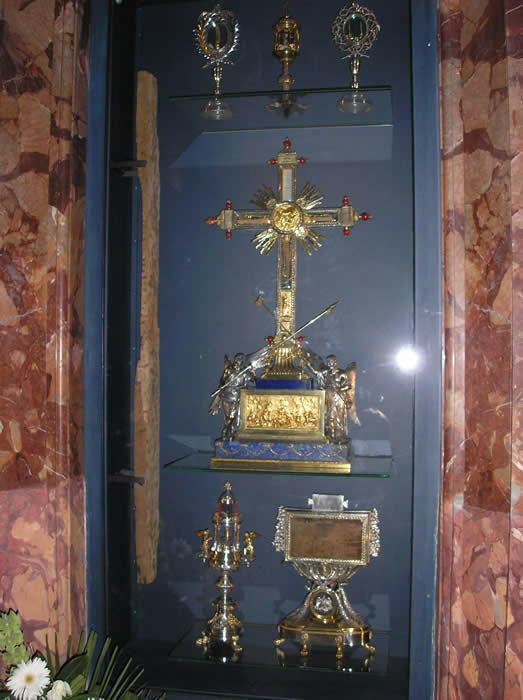 The relic of the True Cross is in the vertical and horizontal beams of the Cross in the photograph. The beam of wood outside of the Cross is from the cross of Saint Dismas. The case on the upper left of the Cross contains the goldened finger of Saint Thomas the Apostled that probed Our Lords five wounds. The case on the upper right contains two of the thorns from the Crown of Thorns. The case on the lower left contains one of the nails that our sins had caused to be hammered into Our Lord's Holy Body. The case on the lower right contains the wooden inscription carved out in four languages at the behest of Pontius Pilate and placed over Our Lord's Head: Jesus of Nazareth, King of the Jews.